Hylomar® Universal Blue is a remarkable product, with a unique set of properties that make it suitable for use as a temporary adhesive in addition to its standard uses as a sealant. Universal Blue is a non-setting sealant, which means that it works much like a 3M Post It® note. It is a tacky putty, that has strong adhesion to various substrates, but very weak cohesive strength. In other words, it pulls apart easily, but remains sticking to both sides. Hylomar® Universal Blue was developed in the 1950's for sealing jet engines by Rolls Royce and Hylomar's predecessor company Marston Bentley Ltd. When pulled apart, and then returned to contact, the Hylomar polymer will reheal itself, again like a Post It® note. Unlike other "tackifiers", the Hylomar polymer remains strong at high temperatures, resists oils, fuels, and other chemicals, and remains chemically stabile, not curing over time. Various applications have been developed over the years to take advantage of Universal Blue's capabilities as a temporary adhesive and sealant:. Hylomar® Universal Blue is a favorite gasket dressing, as it holds gaskets in place, yet allows them to be adjusted or removed without tearing, scraping, or damaging the gaskets. 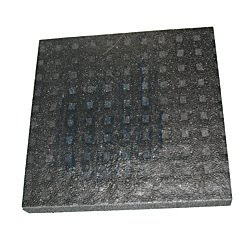 It works well with rubber, paper, cork, as well as metal and composite gaskets. 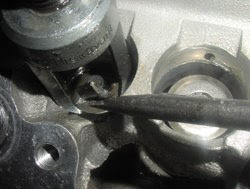 Universal Blue also improves the gasket's sealing ability, as it fills in micropores on the surface of the joint, and will expand and fill any gaps between the gasket and the surface. 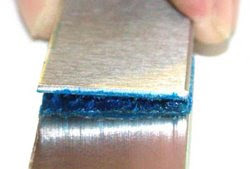 This prevents leaks that tend to occur as the gasket's materials compress and lose their flexibility (know as "compression set"), which occurs as the materials age and are exposed to heat, chemicals, and repeated joint movement..
Universal Blue has been used to hold foam cores in place, such as soundproofing materials, during assembly operations (for example on a door panel). The final assembly was held in place with fasteners, but the Universal Blue allowed the assembly to be done with fewer fasteners and in a different sequence. 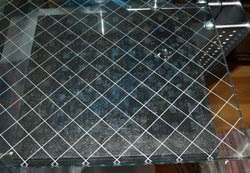 In the next picture,the TPO is shown adhering to a glass surface. Universal Blue adheres very well to glass, and ok to TPO (a polyethylene mix). But a foam with a smooth surface or a foil liner makes a better surface for Universal Blue to adhere to. For example, Universal Blue has been used to hold thin sheets of plastics laminates in place in hot, inhospitable environments as a temporary placeholder (it resists heat to 250°C or more). Universal Blue has excellent adhesion to just about all low energy surfaces. 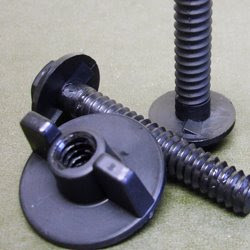 It has also been used on plastic bolts as a thread sealant. See our Case Study on Universal Blue as a thread sealant. Hylomar® Universal Blue also serves to reduce noice and vibration in plastics, eliminating buzzes, clicks, and rattles.. 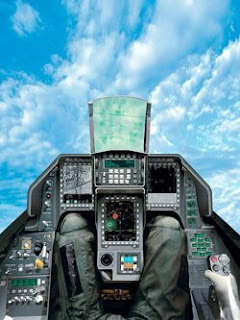 It has been used on the mounts of heads up displays on jet fighters, for example, to reduce vibration and make them easier to read (as well as to protect the electrical connectors). 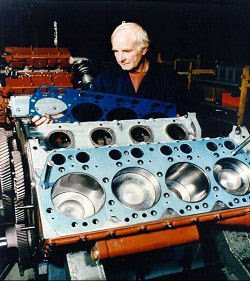 Automotive applications include dashboards and seat fittings, where dampening was sought to reduce noise and vibration. 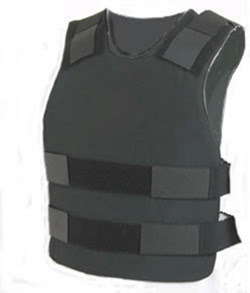 Hylomar® Universal Blue has been trialed as an intermediate layer between Kevlar® in bullet proof vests. The Universal Blue held the layers together and in place without stitching or solid bonds, which allowed the Kevlar® to move more freely on impact, absorbing more of the energy from the projectiles before tearing. Hylomar® Universal Blue is also thixotropic, meaning it stiffens up when under pressure from joint movement, absorbing more energy. Our latest inspiration came from the frustration of handling valve locks. Most of the tools used to hold the "keepers" in place use magnets. OEMs have special tooling. But regular mechanics need 3 hands to compress the spring, use a magnetic screwdriver, and work in a tight spot. See our other Case Study: Installing Valve Locks Using HyloKeepers or Universal Blue. So we decided to coat a keeper with a thin layer of Universal Blue, and it worked great. The keeper would stick to the valve stem, and not fall off, while the spring was put in place and the valve assembly completed. We were so impressed, we have applied for a patent to cover the process, and have adapted the formulation to make it a better coating. 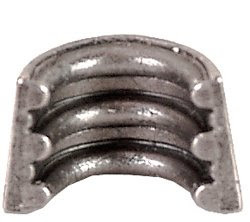 This "keeper" or "valve lock" (collet in UK English) has been coated with the Hylokeeper coating.The coating is so thin, the keepers don't stick together, nor are they particularly sticky to the touch, but they will adhere to the valve stem. Our partners were impressed, too. Ferrea has moved to coat all their high-end valve locks with the Hylokeeper™ technology, and became a major Hylomar® distributor.